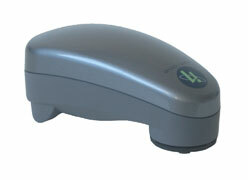 The X-Rite Eye-One® is a spectrometer. The Eye-One® is a handheld spectrometer which measures from 380 to 730 nm, inclusive. Spectral data is reported at 10 nm intervals. It is accompanied by a kit of accessories which include a monitor attachment, a projector attachment, a spot metering tool, a strip reading ruler, and a filter for ambient light measurement. A version of the Eye-One® is available with a factory installed UV Cut filter. It uses a tungsten-halogen bulb for illuminating reflective specimens. This instrument is connected to a host computer with a USB connection. This instrument is currently being manufactured.